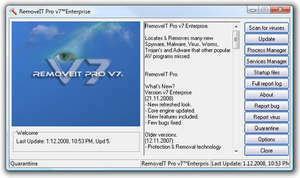 RemoveIt Pro (Enterprise Edition) is an alternative antivirus software application which claims to be able to remove uncommon viruses which other, more popular antivirus applications have missed. Functioning as an all-in-one malware removal system, RemoveIt Pro detects spyware, adware applications, viruses, malware, trojans and worms. One of the things RemoveIt Pro specializes in is removing foreign files which appear in the Windows installation directory, a common target for malware attempting to hide itself within the operating system. The newest versions of RemoveIt Pro include a newish layout, several bugfixes and a refresh of the core engine used to detect malware residing on your computer system. RemoveIT Pro Enterprise 2016 is a shareware program and can be used as a demo to try the software until the free trial period has ended. A full version of the program is available after the trial period ends. For security reasons, you should also check out the RemoveIT Pro Enterprise download at LO4D.com which includes virus and malware tests. Additional screenshots of this application download may be available, too. 4 out of 5 based on 49 ratings.